Most of the news here are no real surprise, but there was one that jumped out at me. BROTHER LOVE! Bruce Prichard is making his return to the WWE after 9 years since he was fired. While most people know him primarily as Brother Love, Bruce Prichard was a key player in the WWF/WWE for around 30 years working in everything from creative to talent management. Over the last two years, he has been doing the terrific podcast "Something to Wrestle With" alongside Conrad Thompson. This podcast is must list to for anyone who claims to be a wrestling fan. Bruce also posts daily videos on Facebook, showing off artifacts from his time in WWF. TNA, even Houston Wrestling. Congratulations to Bruce Prichard! I was fortunate enough to meet Bruce after one of his live shows last year. I told him how the Masked Ace's precious Mama always hated Brother Love. He got a huge smile and said, "Yeah, I can definitely understand that!" 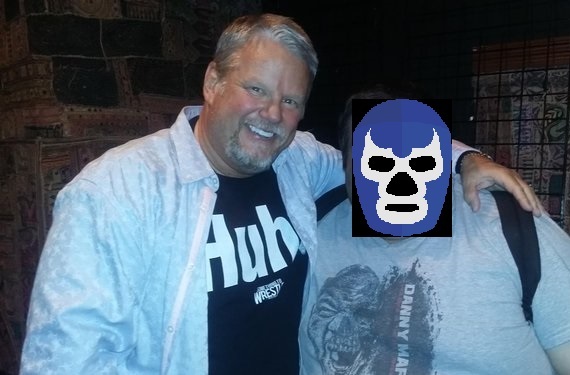 Of course, the Masked Ace was going to be watching Raw's 25th Anniversary anyway, but adding Bruce Prichard makes it a much more accurate representation of the history of RAW and WWF/WWE.